Marist ‘Third Order’ groups or individuals are a traditional way of understanding Marist Laity. 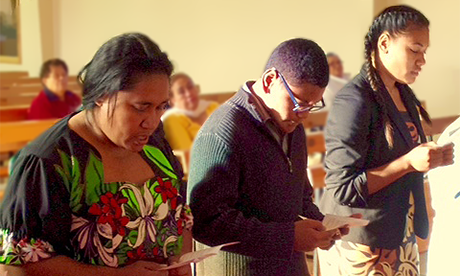 Typically people who belong to the Marist Third Order embark in a process of formation to learn about Marist Spirituality and are then received as members. Each month from February to December, material is prepared at the Marist Centre in Wellington, sometimes from material sent in by groups, or individuals. Third Order groups in New Zealand receive a CD, accompanying leaflets, and a newsletter, to guide a monthly meeting, while groups overseas groups associated to New Zealand can also receive material by post, or by email notification when new material is available on this web site. Interested Lay Marists anywhere can also sign up for the email notification. generally there is a priest co-ordinator who assists the groups with their meetings, by providing relevant discussion guides.